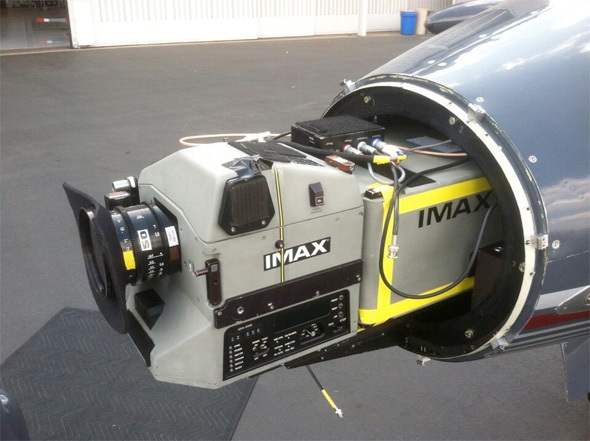 By now, it would be news if Christopher Nolan wasn't shooting part of his film using IMAX cameras. Since utilizing the large format film on The Dark Knight, the director has taken advantage of the beautiful tools from IMAX to deliver some amazing imagery to the big screen. Now he's at it again with the sci-fi flick Interstellar, which follows a group of explorers who make use of a newly discovered wormhole to surpass the limitations on human space travel and conquer the vast distances involved in an interstellar voyage. Now we have a first glimpse at something awesome Nolan is doing with the IMAX camera this time. Look! We don't know what this rig will be used to shoot (probably big landscape shots, or even sweeping establishing shots of a city, the sky, etc. ), but the fact that he feels the need to rig the camera to a jet is pretty cool. 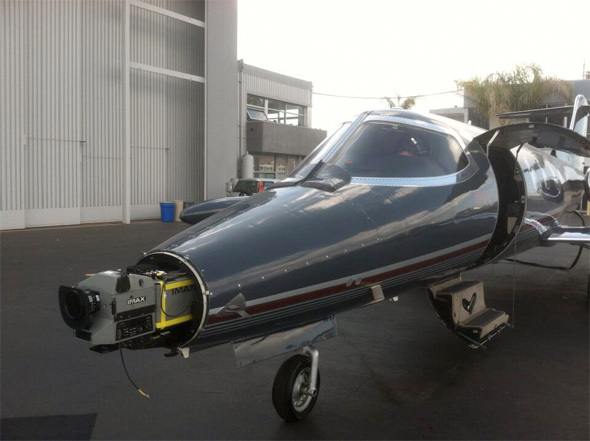 The above photos of the camera in the jet came from @PaulJFranklin, who has worked with Nolan since Batman Begins. They've since been taken down but Reddit still had them up. This sounds like something they wanted to keep quiet, but here we are. Interstellar stars Matthew McConaughey, Anne Hathaway, Michael Caine and Jessica Chastain. Warner Bros. releases the film on November 7th, 2014.
lol - you'd think so at this point. This is great stuff, he filmed something like 20-30 minutes of TDK with IMAX cameras(To my recollection) filmed certain sequences from Inception on 65mm(which is essentially the next best thing after IMAX) and had, to my memory, nearly an hour of IMAX footage in The Dark Knight Rises. I hope he continues to push it further, and that as much Interstellar as possible gets filmed with an IMAX camera. I want this to be the type of movie that they re-release into IMAX theaters every year for the next 10 years, or one that they just keep playing year-round, on constant rotation from one IMAX screen to another...like the IMAX documentaries filmed in the format. LOL! I love this. Nolan is bold. Basic plot sounds interesting. Will be following this movie.